JAMAICA, Queens (WABC) -- Two men are still being sought after police fired a shot at a group of men with two imitation firearms in a city-run apartment building in Jamaica. Police said around 8 p.m. Wednesday, police responded to a call about a fight and drug use at a building on 159th Street. 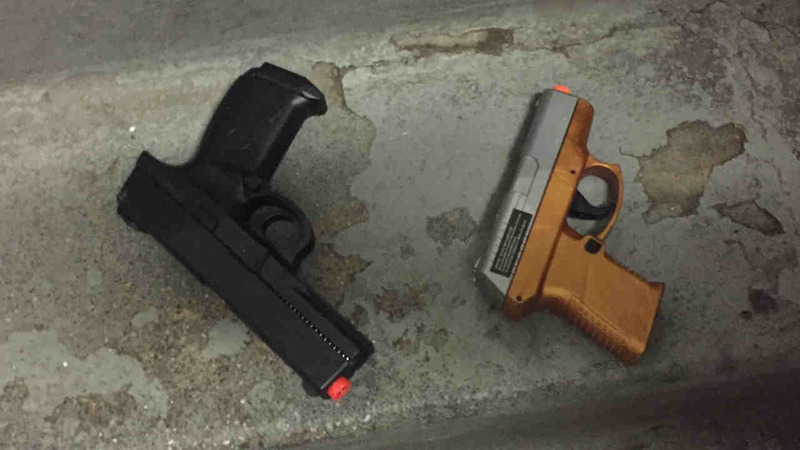 Three men, two holding the imitation guns, were in a second-floor stairwell. The officers drew their guns and ordered the men not to move. When at least one of the men with the toy gun turned toward the officers, and a police sergeant fired one shot. No one was hit. One of the suspects was arrested. The other two ran away. The two imitation guns (pictured above) were recovered.